ARMING YOUR SYSTEM IN THE “ON” MODE. Ready light will be on or flashing when all protected zones and sensors are secure. NOTE: If any zones are bypassed, a sensor in that zone can be violated without affecting the ready light. The security system will not arm if the ready light is not on or flashing. If the power light is off, you have no AC power. Restore power if possible. If not,contact your installation company listed on page 1 of this booklet for service. The armed and exit lights will illuminate. You may now leave the building. Note: The exit light will flash rapidly for the last 10 seconds of the exit delay as a warning to the user that the exit time is about to expire. The user may wish to press the [Exit] key to start the exit delay again or disarm and rearm the system if more time is needed. Step 2 Press the [Partial] key. The bypass light will illuminate if any zone(s) is bypassed. The light(s) corresponding to the bypassed zone(s) will illuminate,alerting the user that a zone(s) may be unprotected and can be faulted without an alarm. The Quick Arm feature may be used if it is enabled. Quick Arm will allow the user to arm the security system in the ON mode by pressing the [ON] key. The system can be quick armed in the Partial mode by pressing the [PARTIAL] key. This feature is used for ARMING ONLY, and should not be enabled to disarm the security system. This is ideal for a maidor baby sitter code, etc. Step 2 If required (optional), enter user code, if required (optional). To manually un-bypass zones, perform the bypassing procedure on a zone that is already bypassed. The corresponding light for that zone will go off when un-bypassed. NOTE: All zones will automatically be un-bypassed each time the system is disarmed. By pressing the [BYPASS] key, followed by the  key, then the [BYPASS] key again, all zones that are designated as group bypass zones will be bypassed. Now you can arm your system in either the [ON] or [PARTIAL] mode. Once armed (and the bypass toggle feature is enabled) press the [BYPASS] key again to exit group bypassing. Whenever an alarm activation occurs on your system, all zones that were in alarm during that activation will be held in memory. The last alarm activation can be reviewed via the function listed below. i.e. You can see which area has activated the alarm. The ALARM MEMORY feature will flash those zones that created alarms and will light steady those zones that were bypassed during the last alarm. 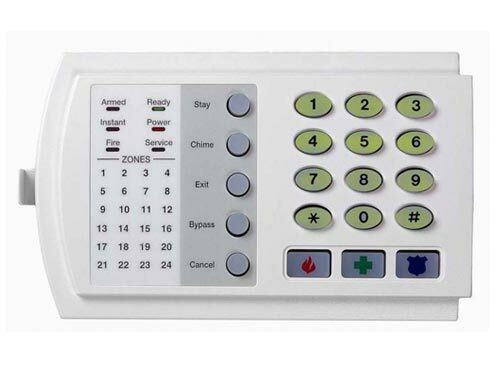 The door chime is turned on or off by pressing the [CHIME] key while the system is in the disarmed state. If the chime is on, the chime light will be illuminated. If the chime is off, the chime light will be off. Each press of the [CHIME] key will toggle the chime feature on/off and produce a momentary ding-dong sound. Step 1 Press the [p] key. Step 2 Press the [p] key. Step 4 If the code pad begins beeping, the reset did not execute properly. Enter your code to silence the code pad. Wait a few minutes and repeat step 2 to attempt another reset. If the code pad still beeps after repeated attempts,please contact your installer. NOTE:You must hold these keys for 2 seconds to activate these functions. Your system may not be programmed for these activation keys (see page 1). You should press these keys only in an emergency situation that requires response by emergency personnel. If your system is programmed for these functions, the following reports can be sent. Fire Key – This key can activate the fire alarm when pressed for two seconds.If your system is connected to a monitoring centre, an emergency report could be sent to that centre. Auxiliary Emergency Key – This key can activate the auxiliary alarm when pressed for two seconds. If your system is connected to a monitoring centre,an emergency report could be sent to that centre. Police (Panic/Hold-Up) Key – This key can sound a local audible alarm when pressed for two seconds. If your system is connected to a monitoring centre,an emergency report could be transmitted to that centre. NOTE: Some Panic/Hold-Up alarms are programmed to be silent at the protected site while reporting an alarm to the monitoring centre. Check with your installation company to determine how your security system will respond to the Panic/Hold-Up activation. Step 1 Press the [*]--. Step 2 Enter the “Master Code”. Step 5 Enter the “Day Code”. This must always be two (2) digits. Example: The 5th would be entered as –. Step 6 Enter the last two digits of the “Year Code”. Example: For 2000 enter –. Step 2 Press the - keys. Step 3 Enter the “Master Code “. Step 4 Enter the “hour code” which must be two (2) digits. Note: The clock is a 24hour clock.Example: 12.00 am would be entered as -, 7.00 am would be entered as -, and 5.00 pm would be entered as -. Step 5 Enter the “minutes code” which must be two (2) digits. Example: 7 minutes after would be entered  – . Step 2 Press the - key. The test will be performed as programmed. Step 3 If the siren test is performed, enter a user code to silence the siren. No alarms will be sent and no reports will be sent unless a communicator test is performed, at which time a test signal will be sent. Step 1 Press the [p] [Chime] key. Step 2 Enter a “Master Arm/Disarm Code”. Now all zones become 24 hour, silent,and local (non-reporting zones). By faulting any zone, that zone will latch its zone light on the LED code pad, and sound the Chime. The Chime will continue to sound each time a zone is faulted. Once all zones are tested(zone lights lit on the LED code pad), go to Step 3. Step 3 Press a “Master Arm/Disarm Code”. The service light will be “on” if the security system requires service. If the service light is“on”, press the [p] key followed by the  key to determine the service condition. One or more zone lights will illuminate indicating what service(s) is required. Call your service provider immediately for these problems. Below is a listing of what each light means in a service condition. 2 ZONE TAMPER – Press the  key and the zone light(s) will illuminate showing the zone(s) that is tampered. Press the [#] key to return to the 1 of 8 service lights. 3 ZONE LOW BATTERY – Press the  key. The zone light(s) will illuminate showing which zone(s) has a low battery. This only applies to wireless zones.Press the [#] key to return to the 1 of 8 service lights. 4 ZONE LOSS OF SUPERVISION – Press the  key and the zone light(s) will illuminate showing which zone(s) has loss of supervision. This only applies to wireless zones. Press [#] key to return to the 1 of 8 service lights. 5 ZONE TROUBLE – Press the  key and the zone light(s) will illuminate showing which zone(s) has a trouble condition. Press the [#] key to return to the 1 of 8 service lights. 7 FAILURE TO COMMUNICATE – This light will illuminate when there is a failure to communicate between your system and the central station. 7 LOSS OF SYSTEM TIME – This light will illuminate when there has been a loss of power and your system clock needs to be reset. Instructions are on page 13. Exit To exit the Service Light Mode – press the [#] key. 1 Beeps for all keypresses. 2 Sounds a continuous tone during the entry delay time. 3 Pulses when a day zone is violated while the system is disarmed. 4 Pulses when a fire zone has a trouble condition. 5 Beeps 3 times for trying to arm with the “Ready” light off, if “Force Arming” has not been selected. 6 Beeps for 1 second or emits a “ding-dong” sound for the “Chime” feature. 7 Beeps during an exit delay; beeps rapidly for the last 10 seconds of an exitdelay; and beeps 1 second at the end of the exit delay. 8 Pulses when the armed status changes and the AC power is off. 9 Pulses when the armed status changes and any zone(s) is bypassed. 10 Pulses when the armed status changes and a low battery is detected. 11 Pulses when the armed status changes and a tamper condition is detected. Beeps to indicate telephone line cut, if selected. 12 Pulses when one or more of the following conditions are detected: zone or box tamper, low battery, ac power fail, or expander trouble. Entering a valid code will silence the code pad sounder when it is pulsing. Please contact your installer if a trouble condition exists. Step 2 Press the [p]  keys. Step 3 Enter a “Master Arm/Disarm Code”. Step 5 Enter the 2 digit “user number” (always enter 2 digit such as - for user 3,or - for user 52). Step 6 Enter the new four (4) or six (6) digit “user code”. Note: To delete a user code,enter[Chime]-[Chime]-[Chime]-[Chime] for a 4-digit code, or [Chime]-[Chime]-[Chime]-[Chime]-[Chime]-[Chime] for a 6-digit code. Step 1 Press the [p] keys. Step 2 Enter a “Master Arm/Disarm Code”. NOTE: Someone changing the authority of another person can only add or remove authorization if they have access to that same authority level. 4 Master Arm/Disarm (can program other codes) 8 If this light is on, Press [#] – [#] to exit. Step 6 Press the [p][p]. This returns you to Step 3. At this point you may enter another user number to assign authority level. Repeat Steps 4 – 6 until you have assigned authority levels to all user numbers.